This memorandum is a business plan. It is not an offering for sale of any securities of the company. 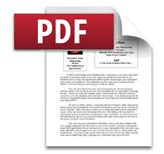 It is for your confidential use only and may not be reproduced, sold, or redistributed without prior written approval of Northwest Film Projects (NFP). Mission Statement – Northwest Film Projects, Inc.
NFP uses new media technologies to help young people develop self-esteem, emotional intelligence, and moral imagination through media-literacy education as well as developing and producing fiction stories and documentaries that exalts themes of moral excellence, social responsibility, unselfish behavior, and respect for others (tolerance). The goal of the War & Remembrance Museum is to create a socially responsible non-profit organization for vets, that will support itself by offering: 1) potential sponsors advertising and marketing opportunities at very low cost, and 2), an opportunity for investors to share in certain for-profit rewards, of NFP . Both possibilities are interlinked in this plan to provide a necessary and much needed non-profit public archival organization for long term preservation and digital distribution of war veteran interviews, historical military events, records, and information currently unavailable to the general public. This business plan is based on the idea that the Internet, when properly utilized, offers product manufactures alternative means of distribution for their products and ideas. The plan is intentionally small, and reflects using grassroots starter seeds as a means of growing an e-museum into a world-class entity. Its non-profit side, with potential tax incentives and cost-effective ways for corporations to re-advertise themselves in imaginative and new ways that do not irritate, and allow for free public participation in marketing their own goods and services in much better ways than traditional advertising, which often is wasteful and destructive of the message sent. Creating a public free-use non-profit website can, in our scenario, enhance income and social goodwill for a company as well as attach stickiness opportunities for their products. In short, we will build a nonprofit website and following beta testing, will use its form to generate a for-profit (and more expensive) media distribution center that freely disseminates as well as sells royalty free materials from one sector of the general public to another. Most of it will be of educational and how-2 value, and mixed in with it will be demos (ads) and tool sales (sponsors). Mr. Devlin is a Senior Producer Writer with extensive management background in national and international motion picture- television production, including development, budgeting, and creative contract negotiations. He has supervised large groups of non-professional artists and technicians working in new media environment environments. A graduate of University of Dayton, Ohio, Mr. Devlin received a BA in Communication Arts. As a Field Artillery Lieutenant, he briefly served as liaison officer to network entertainment shows, before working as a writer, producer, and director for the US Fourth Army Educational Television Network. He and his crew traveled across country, where he wrote and produced and directed over two dozen educational productions including: “HOW TO BRUSH YOUR TEETH”, “AVOIDING VENEREAL DISEASE”, “THE FORWARD OBSERVER”, “EMERGENCY FIELD MEDICINE”, “AIR ASSULT”, and “FT. SILL NIGHTLY NEWS”. Upon honorable discharge, Mr. Devlin worked as a writer, producer, cinematographer and large format still photographer at a small commercial boutique in Ohio for clients such as: CINCINNATI ZOO, GE, IBM, OWENS CORNING FIBERGLASS, SCHOENLING BEER, PONTIAC, FRIGIDAIRE, DAYTON CITY BEAUTIFUL COUNSEL, MOUNTAIN BELL TELEPHONE, and THE NEW YORK CITY MENTAL HEALTH DEPARTMENT. While working as a large format still photographer in NYC, Mr. Devlin wrote, directed, and photographed a thirty-minute documentary on aging for KABC-TV, LONELY AUTUMN” and an IBM environmental documentary for NYC broadcast entitled “THERE ARE LIMITS”. Mr. Devlin entered the motion picture industry through the DGA Producer’s Training Program as one of five, out of three thousand tested applicants. Since then, he has since worked steadily on numerous Studio film and network television projects as an Assistant Director, Production Manager, and Producer. Mr. Devlin left Hollywood in 1998 to open his own company, Northwest Film Projects, Inc. He has taught Continued-Ed classes in screenplay writing, media literacy, photography, and film-making in Los Angeles and Washington State. Some of his producing credits include: My Last Love (CBS), George Of The Jungle (Disney), D3: The Mighty Ducks (Disney), The Judds: Love Can Build A Bridge (NBC), When A Man Loves A Woman (Disney), The Switch (ABC), For Their Own Good (ABC, and Sleeping With The Enemy (FOX). PROFESSIONAL ORGANIZATIONS : Director’s Guild, Writer’s Guild, Film Editor’s Guild, Alliance for Community Media, Citizens for Responsible Media, Teamsters, Mensa. PERSONAL INTERESTS: Reading, Carpentry, Sailing, Photography, Classical Guitar, Computer Technology, Art, Gardening, Skiing, and Physical Science. Mr. Devlin, father of two children -Tad Ashley and Shean Michelle, currently lives in rural Washington State with his wife Diana,. They have five grandchildren, three cats, four squirrels , six jays, seven goldfish, one possum, and three raccoons in the family. Northwest Film Projects Inc. started in 1998 as a grass-roots media literacy company designed to produce media programs for community access television and the Internet. We hoped the extremely low cost digital media offered would allow rural educators, non-profits, small businesses, and others living locally to compete internationally. The early 90’s predictions written in book like The Digital Economy, and Wikinomics were, at last, coming true. During that time internet speed ranged from 33K to 56K. Only the banks, government, and large corporations could afford T-1 access. In 1998, DVD s were not on the market, and PCs were running Windows 95 or NT4.0. Even though the first real digital camcorder, the Canon XL-1, made it’s entrance in January f 98, there were no video editing tools that worked with the new camera. It was an exciting and albeit, trying time for start ups, and dreamers. As a media professional working in the Hollywood movie system, I saw the digital revolution as a new chance for America to evolve into better Republic, and far freer democracy; and a place where free speech and social ideals would not be limited by cost or geography. It was America’s time to export education to the world on a PC, without big and mortar investments. Virtual learning and McLuhan’s global village had arrived. NFP set two goals for itself: first, train young people to understand“media literacy”, the ability to covey complex ideas visually. We used experiential learning techniques because we believed things are learned faster and remembered longer when done that way; secondly we sought create a quality community access television station locally through a start-up 501c3 – LCTV that we hoped, over time would produce local programs, allowing NFP an outlet for it’s larger mentored projects such as The Immigrant Garden, a video that won the excellence in educational media award at the 2002 Dallas International Media Festival (AECT), a Dove Award Seal for family programming and, as the first all digital movie made in America, ran for a fee on Comcast’s VOD system in 2005, the only indie film to do so that year. Regardless of the economy failing through the 0-0 decade , NFP continued it’s pursuit of B:17: Voices of the Air documentary with interviews continued at our own expense. We sought co-operative support from brick and mortar museums, academies, senators, congressmen, historians, archival foundations, and grant organizations. They wanted the materials in their archives, but demanding complete ownership of the materials, requiring us to pay for their archival because none had any concrete funds to show, or preserve our materials for others. This meant we would be responsible for not only for providing the materials, but to also pay for maintaining the materials given without having any access rights from them. This was something we chose not to do. We objected to releasing our materials to them without retaining certain rights of ownership for the purpose of allowing recoupment of expenses by our investors. To give any museum B-17:Voices of the Air materials in perpetuity without rights would be suicide NFP. We recently contacted a Vietnam War vet who, like us, conducted WW-II interviews at his own expense. We wished to include his soldier interviews materials (10 years in the making) in the War & Remembrance Museum on a non-exclusive basis. We told him some of his interviews would be free, and those selected for commercial use would sold on a royalty-free basis with NFP 60/40. He would get 40% of Net Gross and NFP would get 60%, oh which 20% would go to non-profit veteran agencies. Unfortunately for the vet, his several hundred interviews, and several thousand hours of work stayed inside the Dwight D. Eisenhower Presidential Library. He currently pays the Presidential Library $250/month to maintain his materials, but has no legal access to them. When we contacted this war vet we asked if we could include his interviews on our website via a non-exclusive license agreement that would allow him to keep full rights to the materials while we held an open source user license. He contacted the Presidential Library and discovered for himself that he had no rights to the material. It belonged to them, meaning the materials sit in a vault, unavailable for public use, until someone with cash pays fees and royalties to them. He may only see them if he physically enter the museum and stays there to watch. All too often, this is the case with donated media materials the filmmaker intended for public consumption. Museums are so financially trapped they see media ownership as a quick way to make money. Even though copyrights laws specifically state media materials created by taxpayers belong to the public, in reality, it is not the case. The national archives in Washington DC charge a transfer fee $150 /item + $45/second use fee (which ends up being paid to a third party like Microsoft digital, Getty Images, or some other film library-archival corporation). $3,000 per minute for stock footage+ royalties is far too much for the You-Tube, or most small companies like NFP for that matter, resulting in a kind of censorship of those who risked life and limb for free speech and open access to public information. The overhead to run a brick and mortar museum today exceeds it’s ability to finance itself. As costs rise, more and more brick institutions will fail in the face of the rising digital economy. To survive in the short run, now look back at the old days of network television, newspapers, and magazines when money was available to charge exorbitant rates for media, but with niche market wikinomics, that is no longer the case. Technology has indeed made the world flat. Even so, to date, we have yet to find any brick and mortar museums providing free open source media content for public use on the Internet. This will change, like it or not. The Las Vegas Art Museum slashed 30 percent of its budget, then closed its doors in February although its board called the closure “a hibernation” until the economy rebounds. The Art Institute of Chicago’s endowment dropped 25 percent; it boosted the price of admission 50 percent to $18, prompting city aldermen to threaten to shut down the museum’s free city water. The Detroit Institute of Arts cut 20 percent of its staff, and Baltimore’s Walters Art Museum and the Denver Art Museum both canceled upcoming exhibitions. The recession has hit so hard that two museums have even done the unthinkable: In New York City, the National Academy Museum and School of Fine Arts, facing a $2.5 million debt, sold two artworks from its collection to cover operating costs. And in Boston, Brandeis University has proposed selling pieces of its collection, if needed, to boost the school’s falling endowment. Besides raising admission fees, the Art Institute of Chicago ended upper management raises and lowered gallery temperatures; it is on tap to open a new $300 million “Modern Wing” in May, paid almost exclusively with private donations made before the economy soured. The Metropolitan Museum of Art in New York announced it will cut 250 positions by summer and close 15 museum stores across the country. An online virtual museum can cost very little. Building one like below using flash with an interactive floor plan cost under $100 to set up on line as opposed to $55 million to build the real thing. It is estimated one third of American highways, two thirds of its bridges as well as its sewers, drains, levies, and dams are crumbling. Our infrastructure is on the brink of collapse due to neglect. If not addressed within the next five- ten years it could turn catastrophic leaving our country faced with bankruptcy, economic meltdown, and social collapse. In such an environment it’s going to become more and more difficult over the next decade to find the necessary capitol to maintain physical institutions. Schools, libraries, and museums are the physical depositories of our knowledge need to use digital technologies to solve educational problems, as relying on smaller class sizes and building more structures only make the problems of education worse. Without books a library is nothing more than a building. Without artifacts, museums lose their history, and until educators embrace virtual experiential learning over physical, schools will become depositories of decay. It need not be the case. The digital revolution offers huge financial benefits to institutions gathering and distributing information online. Look at Google or amazon, both wikinomic based companies. What’s the biggest institution failing in America because it ignored the digital revolution? The US Postal system. Digital can mean. teleconferencing, distance learning, and global market accessibility. It can become the seed upon which a new cleaner infrastructure will be grown. It offers records keeping and world wide distribution of data around the wold instantaneously, and at a fraction of the cost of the US mail. There will always be a need for physical infrastructures, but the cost of mailing them could be a lost less than it is today. It’s like the ad for Xerox where everyone around a table is fighting to get cost down, and then one of them asks, “What’s all this cost?”while he points to all theatrical documents surrounding them. This same question needs to be asked in the digital economy. Do we put up a building or do we put up a website? Is going to be asked more and more as time goes on. No country, even America, can just keep building infrastructure endlessly in a world that is globally competitive. Yes, there will always be a need for structures, but the decision to build one or not will become more and more, a function of digital alternatives. It is estimated the Library of Congress, with an annual operational budget of $650 million, holds six terabytes of word-information. In the digital age, we can store six terabytes of data on a search-able hard drive for under $700. And although a digital image cannot compete with actual hardware pieces, it can store blueprints and design of such cheaply and efficiently – in case it ever needs to be re-created. As the cost of maintaining physical structures rise, the ability to save decaying infrastructure will decrease exponentially. Digital archiving offers us ways of preserving not only this time, but our past in ways never before possible. Imagine a DVD of Lincoln’s Gettysburg address, or of General Jim McPartlin discussing why in 1941, he was willing to fly B-17 missions day after day into Germany with a 100% change he would never return alive. This is why, even if digital archiving cannot duplicate reality it, like movies, can create experiential learning in emotional and compelling ways. To use new digital technology in ways that will guarantee long term preservation of our past and to help others digitally preserve their own military experiences for posterity; allowing their voices, values, and beliefs to influence our collective memory of the past. To preserve the lessons of war and remember the sacrifices of those who fought them. To offer the public website inter-connectivty with other military websites for the purpose of sharing and remembering what war is, and to serve as a open source media distribution channel cross linking military history information with the general public, as well as military veteran organizations, museums, VFW Posts, military academies, schools, colleges, websites, libraries, historians, and universities. To store digital records and memorabilia of individual military men and woman as a royalty free open source material for the general public to access, copy, and download “on-demand” under an open source license agreement. To have an online book store that sells war memorabilia, books, videos, artwork, essays, for public consumption as well as selling , marketing, and promoting third party private works including videos, books, memorabilia, and educational papers dealing with war, and military history at a 17.5% POS mark up instead of the traditional 65-80% POS changed by brick and mortar institutions. To eventually leverage media distribution access of our own and other third party works to traditional cable television channels, schools, museums, and libraries, thus gaining support for digital archiving of all media records and intellectual properties so we avoid the current Arlington Cemetery fiasco where buried heroes are now missing because in this digital economy no active plans were ever made to digitally code and preserve the original burial records. We need to raise $10,000 start-up capitol to start production of a small minimal non-profit website www.warandrembrance.org for on-line exhibition and distribution of World War II information, including digital images of memorabilia, weapons, tools, artwork, stills, memoirs, veteran interviews, and biographies. This initial site will operate on a beta-test basis; offering file uploads and downloads, forms for use thereof, and muti-links to other WW-II websites. Also included will be a virtual reference library of print and visual media, a screening room, a visitor database, counter, third party news articles, and a community BBS blog. At its core five virtual-library rooms will be created to represent the five military branches of service: Air Force, Army, Coast Guard, Navy, Marine Corps. It will also offer an e-Media Store, and classified ads for buying and selling of third party materials. Fees for selling third party works will initially be 17.5%. and like Amazon, will require the seller meet certain standards, including responsibility for mailing and/or returns. Target date for beta website completion is 90-120 days following receipt of start-up capitol. Investor monies need to flow into a non profit 501c3. which in turn will funnel them to Northwest Film Projects, Inc, as the website producer. Thus, it allows for a partial write-off of investment capitol. NFP has access to a reputable Texas non-profit corporation that charges 1-2% of gross donation funds for monitoring cash flow to and from Investors and NFP. For the investors, depending on internet law and tax codes, we need to set the museum up as a self-funde501c3 controlled by an LLC investor-sponsor board. This insures PR good-will for the site is returned directly back to the investors supporting the site. If the site achieves 3,000 “real” visitors per month, an additional $25,000 in venture capitol will be needed to enhance the site and leverage co-operative support from third party war museums, libraries, military websites, VFW’s, military contractors, government officials, and the general public. All monies should continue to flow through the 501c3 the first year of operation. If the majority of investors agree the site is returning enough funds to verify the site has real potential to support itself a as 501c3 then we should start one for the museum. If not, then the museum website will simply remain open for 2-3 years as a small open-source outlet for war veterans and eventually be turned over to a volunteer group to maintain it; raising their funds through its media-store, donations, limited sponsorships, and individual classified e-ads. In both cases, the $25,000 needs to be available before the beta-site goes public. Not doing so could end in disaster if site visits exponentially exceed 3,000 “real” hits per month. During the making of The Immigrant Garden, a group of NFP media literacy student interns approached us with the idea of making a community access video consisting of interviewing local B17 veterans. We thought it a good idea and so we began. During the process our local government closed down, against all reasonable arguments, the community access station. Left without a distribution outlet, NFP had to scale back. This meant we had to raise the production bar up from the community access level to a professional documentary piece, and would require serious capital funding. Meanwhile, B17 veterans were passing away at a phenomenal rate. We decided to spend the rest of available money continuing the interviews for a three part documentary called B17- Voices of the Air. Our interviews branched out of Lewis County to other states and eventually led us to Germany, where we conducted interviews with Luftwaffe pilots such as Lieutenant-General Gunther Rall, the third most successful fighter Ace in history who later became Military attaché to NATO. We gained some support from Boeing, the 100th bomb group, VFW’s, and volunteers. Of the 240 hours of digital tape we have, we have transcriptions of 50% of them, about 1800 pages. We have combat gun camera footage from the national archives and Polar films in Germany. We lost an option on a historian’s book because of insufficient funds, but still went ahead, and spent one long day flying and filming Evergreen Aviation aka Dell Smith’s B-17. Sadly, in spite of all materials collected, proposals written, and money spent by NFP, the market crash of 2000 coupled with 9/11 a year later, reduced the project to ashes. Promote, market, and sell B-17:Voices of the Air documentary online without paying distribution fees (60-80% of gross) to so called on-line third party distributors. Gain public traffic, status, and distribution contacts by using the power of 24/7 internet access to attract individuals looking for free use a/v materials with a website offering open source-license agreement to them (like sun micro systems does with open office software). Collect and sell third party war materials including stock footage online as a distribution connection center (like Amazon) for videos, books, etc. Offer free download access and open use rights to the general public of video stories, raw footage, and military reporting should result in hits from military colleges, historians, researchers, and soldiers. Using wikinomics theory, we hope to convince our military men, women, and their families to upload video stories and events in their lives (like You Tube) so that a private in Afghanistan or elsewhere can share his experiences with others at home. A non-profit web site the power to offer grassroots fees to the upcoming internet television stations, citizen reporters, and science & technology articles from magazines, etc. The user becomes the author. The story of a plane and the people who revolutionized a nation, altering the course of a war. Revealing stories from those who lived through WW-II. The B-17 forever changed warfare. This mini-series explores how Boeing went nearly bankrupt building the world’s first long-range heavy bomber, the struggles of those who flew it, and the way ordinary individuals, facing extraordinary challenges, gave us a future far different than the one planned by the Axis powers. Part 3) Strategic warfare – engaging civilians as combatants and the massive destruction of life and cities through Allied carpet bombing. Retrospectives of a world rushing toward WW-II as seen through the eyes of those who lived it and their evaluations of the world today. 200 hours of interviews with B17 Pilots, Flight Crews, and builders. This documentary seeks to compare, examine, and understand the values, ideals, and beliefs the “Greatest Generation” held as essential truths. But in today’s world, where new values, such as letting others do the sacrifice is perfectly okay, things seem to be unraveling; coming apart. Pearl Harbor a galvanized America into a unified nation. Sixty-five years later we do not seem as galvanized, nor as unified as we were back them. Perhaps the WW-II generation was as divided as we are today, but kept it quiet as the Silent Generation. Some suggest they were so naive and uninformed they allowed themselves to be manipulated by the power elite, by I doubt it. At least they never said that when interviewed. The 0-0 decade seems too divided, angry, narcissist and selfish to do, as the WW-II generation did, when called upon to sacrifice their needs for the sake of their country. Maybe yes, maybe no. The baby-boomers now in power, the direct benefactors of the silent generation efforts, are now deadlocked, gridlocked, and irresponsible in the ways of governance. Spending more and more money on ourselves without regard for our children reflects current values are quite less honorable and far more immature than those of the forties and fifties. We are again in crisis. The threats of terrorism returning the world to the 13th century are quite real, and the dangers of a dirty nuke or biological attack are far more probable to happen, than not. Is it, as some believe, a basic destruction of the American character? Are we really “the evil empire” many Muslims believe? Or are we a basic decent people who love freedom, even if it means our culture seems to reward immoral behavior far more than hard work. Are we decaying like Rome? Answers to what is happening to us in 2010 does not lie with cable news, our politicians, not our technology or the young. It is the wisdom earned by the final few octogenarians still alive who lived through a great depressions and a horrible war that guide us once again through stormy weather and the clouds of crisis and waste darken these challenging days. 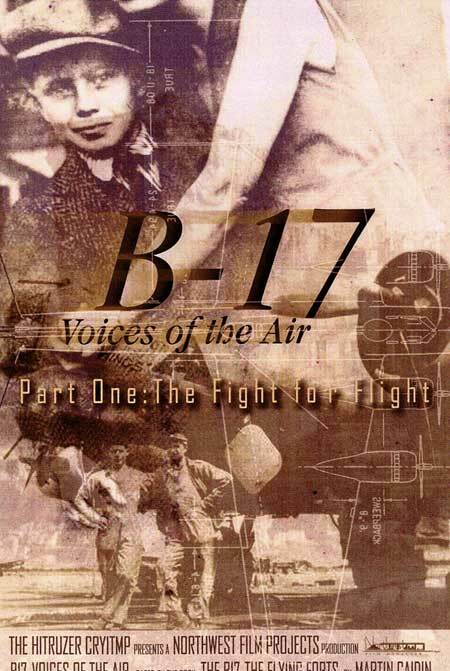 B-17: Voices of the Air is not another documentary about war and battles. It is a about people – ordinary men and women, children who cared enough to offer themselves as grit to oppose the evil enveloping their world. It believes the advice and wisdom from the men and women who faced evil in that time have much to tell us that could be quintessential to solving the crisis we face today. They may even us save the modern world from jumping off a cliff of it’s own making. B-17 Voices of the Air, like the museum, is for young and future generations to learn, through the mouths of the elderly themselves why America, for the WW-II generation, was not just a place, but an ideal worth fighting and dying for. Their stories explain why so many of them volunteered for war, and how ordinary people can conquer extraordinary evil when they rise together in unity to face extraordinary evil and incredible odds. It is a documentary of tipping points in war; how Boeing almost went bankrupt trying to build an air plane nobody wanted, and what guided this nation in their time of great tribulation. Voltaire wrote. “Without vision, people perish”. America today, unlike the America of 1941, is not only facing an enemy from outside its borders, but is also facing a war of values and lack of discipline within itself. If we fail to see and respond to the great danger our self-centeredness poses, all we love and cherish in life may disappear. WW-II ended with the Atomic bomb. WW-III may start with one. Now, more than ever, is the time for this nation to decide what we stand for and whether or not we can re-discover that moral compass that lives in us all. Knowing that tipping points between success and failure, good and evil, hope and despair are often as dependent on the luck of a single atom as they are on hard work and sacrifice. Had we waited and not built the atom bomb our world might be intolerable today, for near the end of WW-II the Japanese military had a secret plan to overthrow the emperor, invade NYC with a dirty nuke, and send suicide troops infected with biological diseases into San Francisco via submarines. The date set for that invasion was September 25th, 1945, just forty days after Hiroshima. Perhaps it is time to we listen and preserve the voices of a passing generation to hear the power of obligation, responsibilities, and self-sacrifice. Perhaps some of those watching B-17 will learn that a wise life requires we follow our passions, beliefs, and faiths with a moral compass; not live it as if life were just a lotto draw. B-17: Voices of the Air shows men and women who risked their lives and put self-comfort aside in WWII. Their stories are lessons in faith, courage, and self-sacrifice; High altitude bombing made fingers freeze off, and combined with low oxygen, cost many their lives. But they meet these obstacles with simplicity, honor, and humility. They grew up in a time before television and the ubiquitous sound bite. Many grew up on farms. Before the war, less than one in three Americans owned a car. Banks closed daily at three, and supermarkets by six. Sunday was for church, family, and picnics. They knew the depression firsthand, and that America offered as many injustices as found elsewhere in the world, but in spite of that, when the war came, they did what they had to do because they believed it was the right thing to do. They did not question it when called. They served, and sacrificed much for one another, and for us. Our hope is these historic interviews will someday empower a future generation to discover a better way of solving the world’s ills than resorting to war. For it is those who have fought in war than hold peace most dear. If successful, will add a full service book, video, and memorabilia store. If successful, the website will serve as a leverage-agent to sell media services and programs to cable internet television via wireless and wired broadband links, such as NFP’s B-17: Voices of the Air Documentary. (ire., Corp for Public Broadcasting) & PBS, Inc. The more targeted the advertisement towards a certain demographic, the higher the CPMs (“cost per thousand”). TIME Magazine for example may have a $15 CPM, while American Police Beat Magazine will have a CPM closer to $50. Online advertising has done well because even though the attract audiences they are, for the most part, more like waging total media war on the consumer than peaceful engagement. CPM’s mean very little when everyone shopping faces high volume sites screaming at them with motion, pop-ups, and other hideous ways of conquest for dollars. Their CPM rate may be low, but in the long term only the shopper of lowest price will visit despite the fatigue caused them. NFP believes this the wrong standard of advertising on the internet. Current web ads are so super “hot” they kill the buyer. Google, the largest advertising agency in the world, with all it’s sophistication and polling, steers clear of hot ads on the Internet. They change for pages, and do not suffer the fallout of bad website ads. After all, they’re “only a search engine”. The coolness of cool there is. Our theory is the web works best under low pressure “cool” ads, and as a medium it is a mistake to use use it like radio (a hot medium) or TV ( a cool medium made hot by the corruption of “megs-selling” messages. Magazines, newspapers, and books are cool zen like forms of media that invite the thoughtful participation of “coolness”non-profits evoke. Websites need to be polite, subtle, beautiful, and soft selling as well. And even though the CPM for a cool niche market boutique site may be more costly , it may offer in the long run, longer term patronage rewards. Running a medical marijuana ad in Police Beat Magazine, with it’s higher CPM, will most probably grab far more attention (“be more sticky”) than it will if placed in Time because of the character of its niche market. Using this philosophy, the museum website will offer Premium Sponsor ads no less than 100 pixels high x 200 pixels wide, set together run underneath the Museum banner at the top of each site page. We will have no more than six ads packaged together on one page. No pop-ups will be allowed. Ads will contain mouse rollovers that will allow viewers to click through to an full information page about the sponsor. We will press advertisers to refrain from hard sell and will offer viewers click-throughs directly to a Sponsor’s website. We will ask all Premium Sponsor’s to buy space for a one year contract minimum. Based on an initial goal of 3,000 index page hits per month (100/day) Premium Sponsor ads with an information marketing page link will cost about $0.045/hit (cpm=$45) which is reasonable when one considers the museum itself is built around a specific niche market, and the page sponsors. Unlike random web ads, there’s little confusion of who’s looking at this site. Click-throughs will not cost extra. For the first two years of operation, rates will not rise, but could go down. Assuming in the initial site has 30 pages gives us 180 sponsorships , and the total page hits for the entire site are 100 index page hits/day and average hits for other pages are 800/day (8 additional pages/visitor) means gross hits of 24,000+3,000=27,000/month, which gives the site an initial income of $1,215 per month. Other ways to raise money will include library and research (searching) donations, public classified ads, bookstore sales, and media use sales. Includes books, news articles, war diaries, soldier bios, interviews, pictures, art work, images of memorabilia, machines of war, history books, references, and the like. 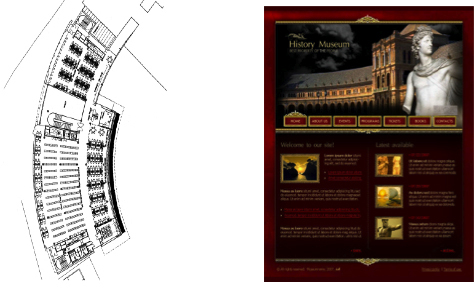 Some will be accessed through links to other libraries and museums, while other materials will be online at our museum. Although some media will be completely free and open use, some will not. Those that are not, will sold non-exclusively under a royalty free license use agreement. Something like this: First there’s $50 dollar set up fee. Then a 99 year use license for $10/minute with a minimum order of 10 minutes. Third party materials sold on the website could be sold the same way; with the website receiving the $50 setup fee +17.5% of the gross sale. Free media use for non-profits and researchers wanting to use this material will have access to a watermark embedded picture with a museum ref- time code window. Other parts of the media library will be free, especially the military You Tube type videos and the memorial part of the museum. Transcripts, books, pictures, and written materials will also be treated this way, some for sale, others free. Will consist of family remembrances of the fallen, and will be structured much like The Virtual Wall Vietnam War Memorial (www.vvmf.org/thewall), except that the information and uploads shall come from family and friends of the deceased. Like craigs list (www.craigslist.org), it will supply online forms for that will allow for uploading of words, pictures, images, and comments. Links to other remembrance websites representing WW-I, WW-II, Korea, Vietnam, Desert Storm, and the current Afghan Iraq war will be present there. We could build the website and nobody comes. If so, the website could still run in cyberspace for very little cost (estimated under $1000/ year) with some volunteers interested in running the website. Loss to investors limited to the $10,000 501c3 donation. Upside, initial start-up investor(s), get s the tax write off plus two free (one-year) banner placement ads on the website, one of which will be merged with main lobby page inside the museum. Sponsor has right to market any museum listing in any third party ads or marketing/PR programs. We could build the website and everybody comes. The website could fail if is too successful, and is unable to have access to venture capitol to meet demands . Thus, success means setting up a money fund capable of meeting an exponentially growing the website quickly. Although not needed at this stage, a serious pre-platform needs to be set up so that serious Venture Capitol ($1-5 million) could be accessed quickly, almost overnight, if this situation arises. We could build the website and interest fades. This website needs constant feeding of new information and interactive involvement from the public to survive. New media, new postings, and new information must be not only maintained, but upgraded overnight. Net security against hackers will rise as the website grows or fades. This is the balancing act that could make or kill us financially – having a website that is growing modestly, but overhead is exceeding income. It’s the death of a thousand cuts that is most dangerous financially. Raise $10,000 to create a small beta site. If more successful, venture $25,000 more to create a pilot reel as a sales piece for making B-17: Voices of the Air Documentary with a third party distribution and exhibition company with enough capitol to finance all production expenses. A&E, Discovery, the History Channel, the Military Channel, are some sample outlets. A digital museum of records because it’s digital, can be cheaply and easily duplicated. It can be duplicated over and over without quality loss, staying with us for as long as there are generations interested in learning and sharing their heritage. Building the War & Remembrance Museum means not only preserving the wisdom and knowledge of WW-II and the Greatest Generation, but one that is capable of passing along the tapestry of wisdom passed on through generations of those not yet born. Even if our venture fails financially, we will still have created a e-museum, a documentary, and our children’s future much richer because of it.